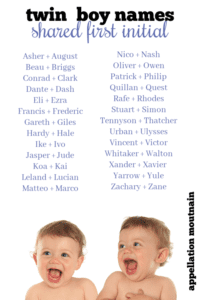 Time for #namegames, this time with twin boy names. We’re choosing pairs with a shared first initial. Think John and James, only more creative. 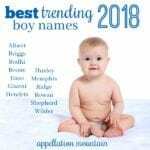 This list is meant for fun, of course, but it might prove helpful if you’re choosing twin boy names, or even just brothers. While some families avoid sharing initials – even if it means ruling out a favorite name – others embrace it as a way to link their kids’ names. Asher + August – Both names feel a little different, but they’re quickly becoming staples for boys born in this generation. Asher means happy, and while August’s meaning is far more, well, grand and august, it carries the joy and light of high summer, too. Beau + Briggs – They’re both short, complete names. Besides the B, they share a rugged, but gentlemanly vibe. Perfect for brothers! Conrad + Clark – Slightly offbeat, but still nicely traditional, Conrad and Clark seem like they could be part of the next wave of retro revival names for boys. Dante + Dash – Both names sound athletic, but they have literary backstories, too. Writer Dante Alighieri of Inferno fame comes to mind, but don’t forget Dashiell Hammett, 20th century detective novelist. Eli + Ezra – A pair of Old Testament names with a modern sound, both names carry appealing meanings. Eli comes from the Hebrew word for ascension, while Ezra means help. Francis + Frederic – Impeccable classics, but both underused. You might call them Frankie and Freddie, but I like them when used in full. Gareth + Giles – From an American perspective, both names sound like little British gentlemen. They’re rare, but instantly familiar – another plus. Hardy + Hale – Hardy and Hale are surname names, linked by more than just the letter H. If you’re hardy, you’re capable and strong. And if you’re hale? Then you’re robust. The subtle similarities in the meanings make this a perfect pair. Ike + Ivo – I love the idea of two mini names, especially when they have different syllable counts. But maybe Ike and Ivo are still too close? Jasper + Jude – Plenty of boy names start with the letter J. I like this pair for brothers because they sound distinct, but both feel like throwback choices currently very popular. 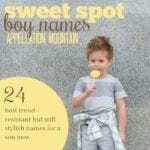 Leland + Lucian – Two gentlemanly L names, Leland and Lucian feel nicely distinctive. And yet, they’re close to favorites like Leo and Luke, so I think they’d wear well on boys today. Marco + Matteo – Match up two romance language spins on traditional masculine choices, both with vibrant o endings, for an unforgettable duo. Nico + Nash – Both Nico + Nash are modern names with deep roots. And while Nash feels a little more rough and tumbled compared to the more polished Nico, I think they make great names for brothers. Oliver + Owen – Yes, they’re both very popular O names. But I think they pair nicely together, linked mainly by that shared initial. Patrick + Philip – We love classic boy names, but so often that means William and James. Patrick and Philip are two of my favorite underused classics, often dismissed because we’re not wild about short forms Pat + Phil. But use the names in full, and they’re very handsome. Quillan + Quest – Are two Q names too much? Or is it just plain unfair to give one son a Q name, leaving the other with a more expected initial? While both of these names are very rare, Quillan seems a little more like a conventional choice than modern virtue Quest. But I think these work. Rafe + Rhodes – A dashing duo, to be sure! Rafe is short for saintly Raphael, while Rhodes is the Greek island, home to the ancient Colossus of Rhodes. Stuart + Simon – Traditional, buttoned-down but not too common, Stuart and Simon sound like brothers. Tennyson + Thatcher – Another pair of surname names. While Thatcher sits just inside the US Top 1000, Tennyson is far rarer. But they feel compatible, don’t they? I imagine them reading books on a river bank somewhere. Urban + Ulysses – No one uses U names for their sons. Or daughters. It’s the least popular first letter, out of all 26. So I almost skipped it. 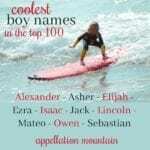 Except there are a few great U names for boys, like the ancient, literary adventurer Ulysses and the saintly, equally ancient Urban. Vincent + Victor – A pair of names that hover just outside the perpetually popular range, and share strong meanings. The first comes from the Latin vincere – to conquer – while the latter is plain as day – again, victor or conqueror. They’re very similar names, and yet the sounds are distinct, even with the same first initial. Whitaker + Walton – I wanted to say Wilder and West, but that’s a little too much, isn’t it? Let’s stick with Whitaker and Walton, instead. They’re both surnames with a quiet strength. They sound like poets who like to hike. Xander + Xavier – The first comes from Alexander; the second, from the surname of a saint. Both feel almost classic, but energetically modern and fresh at the same time. Yarrow + Yule – If you like offbeat, vaguely nature-inspired names, these two Y choices could appeal. Yarrow refers to the herb; Yule, to the Christmas-season, especially the yule log. One brings to mind spring and the other winter, but I think they still work for brothers. Zachary + Zane – Doubtless there are bolder duos starting with the letter Z. But I like Zachary and Zane, two names that are pretty ordinary except for their zippy first initial. Even if you shorten it to Zach, it still feels different enough from Zane that they go together nicely. Not all of the pairs quite fit together, but it was a lot of fun anyway! U – pass – so two Vs in recompense! My faves would be Dash and Dane, Everest and Easton, Laszlo and Linus. I wish someone would explain this obsession with Briggs. I know it’s a surname, but why on earth is the name nerd community trying to spread this one like wildfire all of a sudden? 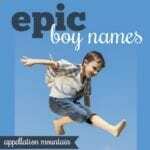 Abby’s done a great write-up (New Endings for Boy Names, I think) on boy names that end in ‘s’. Briggs fits that trend, too! Bennett + Beau = swoon! Oh, some great ones here! Scott + Sam are great together. And Pax + Pike make a great duo, too! But I think my favorites are Dune + Dax. Or maybe Orson + Osprey? Or even Kepler + Kelvin? So hard to choose!